Weather — Queenstown is in a low rainfall area (40-50 inches per year). However, we do experience periods of prolonged rain from time to time. Fishing season — October through April, with the warmer months being January through March. Expect temperatures around 18-25° Celsius (64-77° Fahrenheit). April is a little cooler with generally calm sunny days. 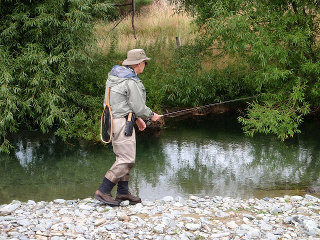 Fly rods — For the waters in this area, we recommend 8½ or 9 feet coupled with 5/6 weight floating fly lines. Double tapered or weight forward. Reels — Bring along your favourite, as long as it can accommodate a minimum of 75 yards of backing. 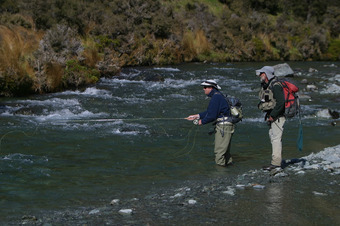 Leaders and tippet — Long leaders are the normal; 12, 14 and sometimes 16 feet tapering to 4x or 5x with matching tippet spools in 3x, 4x, 5x, and 6x. Waders — During the warmer months of December through March, a lightweight pair will be adequate. However, we prefer and find it more comfortable to wear wading shoes and a lightweight nylon pant or shorts over polypropylene or capilene underwear bottoms. Other clothing — To be dull coloured, including your wide-brimmed hat or cap. This will further increase your catch rate. 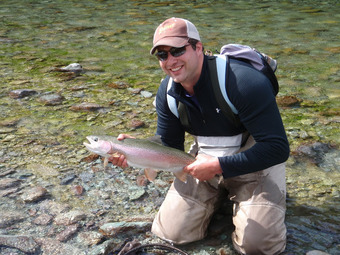 Polarized sun glasses — To enable you to see the fish in our crystal-clear rivers and streams. They remove the glare from the water surface. Rainwear — In the form of a top quality, hooded rain jacket. Small back pack — For items such as snacks, sun screen etc.